DETROIT (Reuters) - Four of the top five U.S. auto sellers on Monday blamed extreme winter weather for poorer-than-expected sales in January, as analysts and executives predicted a rebound in February and March. U.S. automakers Ford Motor Co and General Motors Co as well as Japan's Toyota Motor Sales USA and American Honda Motor Co saw auto sales plummet in January, missing analysts' estimates for the month. "The bad weather only seemed to affect our competitors' stores," teased Chrysler as it reported double-digit sales increases for its Jeep and Ram truck brands. John Mendel, head of Honda's U.S. sales operation, said: "January's foul weather cooled things a bit," adding that "we look forward to a warming trend" in the coming months. While snow and bone-chilling weather drove total U.S. auto sales down about 3 percent for the month, analysts said any dip in January sales should not cut into the industry's months-long rebound, which has been outpacing the recovery of the overall U.S. economy since the 2008-10 downturn. "The weather's an easy scapegoat - it will be interesting to watch February and March to see if those lost sales in January get made up," said Larry Dominique, executive vice president at industry researcher TrueCar. Fred Diaz, an executive at Nissan, said: "I don't think those sales are gone for good. I think February is going to be a good month for the entire industry." Morgan Stanley estimated industry sales in January were at a seasonally adjusted annual rate of 15.2 million, well below analysts' consensus of 15.7 million. There was little consistency, however, in the initial January sales reports. "It's tough to make any declarative statement" about the disparity in automakers' sales performances, said Gabelli & Co analyst Brian Sponheimer. "It's really hard to pull anything out of January that's trend-worthy." Ford said company sales fell 7.1 percent to 154,644. Analysts polled by Reuters had projected Ford sales of 157,441 in the month. Ford-brand sales dropped 8.4 percent, with declines in such popular models as the Fusion mid-size sedan and the F-Series full-size pickup. But Lincoln brand sales jumped 42.5 percent on the strength of the MKZ sedan and the MKX crossover. GM sales dropped 11.9 percent to 171,486, compared with analysts' average projection of 187,782. All four of GM's U.S. brands saw sales decline in January. Toyota sales fell 7.2 percent in the first month of the year to 146,365, missing analysts' estimate of 153,003, while Honda's sales fell 2.1 percent to 91,631 in January, compared with a projected 97,927. Bucking the downward trend, Chrysler Group's U.S. sales rose 8 percent in the month to 127,183, bolstered by increases at its Jeep and Ram truck brands. Among its bestsellers in January was the new 2014 Jeep Cherokee and sales of the full-size Ram pickup jumped 22 percent, while most rivals in the truck segment reported year-to-year declines. Several analysts observed that full-size pickup pricing is improving with Ford and GM trimming incentive spending on big pickups and selling a richer mix of high-margin truck models. The average transaction price for a Chevrolet Silverado in January was $40,575, up 11.6 percent from a year earlier, according to Kelley Blue Book, an industry research firm. 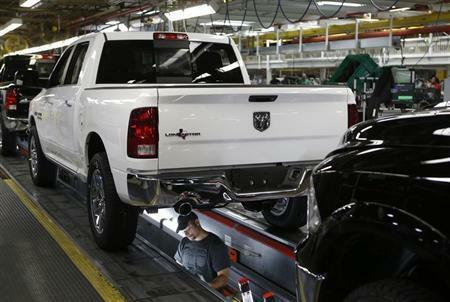 That compares with $40,672 for a Ford F-150, up 0.4 percent; and $37,253 for a Ram 1500, up 2.2 percent. Ford continued to spend heavily on other models, boosting total incentives by 14.6 percent from a year ago, according to TrueCar. In comparison, total incentive spending fell 19.6 percent at Chrysler and 3.6 percent at GM, TrueCar estimated. Among the smaller players, Nissan said sales climbed 11.8 percent to 90,470, above analysts' consensus estimate of 88,744. Sales were driven in part by the Altima mid-size sedan, which beat the Ford Fusion and sold twice as many as the Chevrolet Malibu. Volkswagen of America saw January sales plunge 19.0 percent to 23,494, as its three top sellers - the Golf and Jetta compacts and the mid-size Passat sedan - all fell compared with a year earlier. VW's premium Audi brand said sales remained relatively flat, at 10,101. The BMW group, including Mini, was up 3.0 percent to 20,796, and the Mercedes-Benz group, including Smart, was up 1.5 percent to 24,413. Fuji Heavy Industries' Subaru was up 19.3 percent to 33,000. Korean automaker Hyundai Motor Co said January sales for the Hyundai and Kia brands rose 1.3 percent to 81,016. With the sales downturn, inventories rose in January at Ford and GM. Ford said its stock of unsold vehicles at the end of the month rose to 111 days, compared with 89 a year earlier, while GM's climbed to 114 from 95. Chrysler also saw inventories increase to 105 from 87. The industry considers a 60-day supply normal.